Dubai’s embattled group Dubai World, whose default fears had rocked global markets, Thursday said it reached agreement “in principle” with most of its bank lenders to restructure some 23.5 billion dollars in debt. 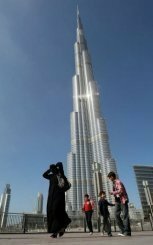 An Emirati woman and her children walk past Burj Khalifa, the world's tallest tower, in debt-ridden Dubai. Dubai's embattled group Dubai World, whose default fears had rocked global markets, Thursday said it reached agreement "in principle" with most of its bank lenders to restructure some 23.5 billion dollars in debt. The agreement still needs the backing of other lenders but appears to give the heavily-indebted Dubai some breathing space in dealing with the obligations of its state firms. “Dubai World is pleased to announce that headline economic terms have been agreed in principle with the Coordinating Committee” representing 60 percent of the group’s bank lenders, the company said in a statement. According to the agreement, the company will divide 14.4 billion dollars of debt into two tranches, maturing in five and eight years respectively, while the government will convert 8.9 billion dollars of aid to the company into equity. The first tranche of debt will be valued at 4.4 billion dollars and will bear 1.0 percent interest with no government shortfall guarantees, while the second will be worth 10 billion dollars, bearing also 1.0 percent interest plus varying options of payment in kind and shortfall guarantees, it said. It also said that the government was committing up to 500 million dollars of Selling, General and Administrative (SG&A) expenses, in addition to an interest facility of up to 1.0 billion dollars. The government will maintain 100 percent ownership of the company, it added. “We are pleased that we have received unanimous support in principle of the CoCom on the headline economic terms to our restructuring proposal,” said Chief Restructuring Officer of Dubai World, Aidan Birkett. “This is an important milestone and reflects our efforts to achieve the best possible solution for all stakeholders,” he added. The company said, however, that the proposal requires the agreement of the remainder of Dubai World’s financial creditors. The government of Dubai and Dubai World had tabled this offer to bank lenders in March after three months of negotiations. At the time, the government offered to inject 9.5 billion dollars into the Dubai World group and its most-troubled subsidiary, property giant developer, Nakheel. But the offer also stipulated that Nakheel will become a separate entity, owned fully by the government. Sheikh Ahmad bin Saeed al-Maktoum, a brother of the ruler of Dubai and head of the emirate’s Supreme Fiscal Committee, welcomed the agreement. “The government of Dubai welcomes this important milestone, which is the result of considerable efforts from a large number of stakeholders who all share a common interest in Dubai’s future,” he said in a statement. Dubai World’s major lenders include four British banks — HSBC, Lloyds, RBS and Standard Chartered, and the Bank of Tokyo, in addition to the local Abu Dhabi Commercial Bank and Dubai’s Emirates NBD bank. Their exposure to Dubai World’s debt is reportedly worth 8.64 billion dollars, or 60 percent of the debt up to restructuring. Dubai rocked global financial markets in late November when it said it might need to freeze debt payments by its largest conglomerate Dubai World, stoking fears of a state default over sovereign debt. The emirate’s financial market, which took severe blows after Dubai’s World debt alert, traded around 1.0 percent up following Thursday’s announcement, and closed just 0.35 percent up at 1,691.71 points. Dubai World is not a listed company. Dubai has issued bonds worth 20 billion dollars since February last year to buoy its troubled firms, which has been fully subscribed by neighbouring Abu Dhabi and the UAE central bank. The Abu Dhabi-based central bank subscribed with 10 billion dollars, while the government of Abu Dhabi and two Abu Dhabi-backed banks subscribed to five billion dollars each. Dubai World’s total debt, including liabilities, is around 60 billion dollars. Dubai’s total debt is estimated at between 80 and 100 billion dollars, although some analysts say it could be as high as 170 billion.